A local CSA box provides the regular two-fold blessing of being a staple food source along with the challenge of how to best use the fresh, local bounty. I absolutely will not allow things to go to waste in my refrigerator, and I’m always in search of simple recipes that call for massive amounts of veggies. And call me crazy, but soup doesn’t get me excited in the summer. Who’s with me on this one? The perfect answer to my produce overload? Roasted Ratatouille. Ratatouille is typically a stew consisting of eggplant, zucchini, green pepper, onion, garlic, and tomatoes. I had all of these things and more…and I wasn’t afraid to improvise. See what you think about this recipe! In a large mixing bowl, combine marinade and chopped vegetables together. Toss to coat all vegetables and allow to sit for 30-45 minutes. Spread marinated vegetables onto a large baking sheet or stone. Roast in a 400° oven for 30-45 minutes, stirring every 15 minutes, until vegetables are tender and look roasted. Sprinkle with fresh basil, a little freshly grated parmesan cheese, and serve as a side dish or over couscous. This recipe serves 4-6 people. No rules here. This is a fridge-clearing recipe so add or omit whatever you like. What creative ways do you prepare summer produce for your family? Thank you for the inspiration, I had almost all those items in my fridge but substituted the red wine & red wine vinegar for balsamic vinegar & I also added hemp seeds, paprika, some braggs, as you said I ‘tinkered’ a bit – very delicious end result & less veggies going bad. Excellent stuff, keep it coming guys! I’ve been making adjustments to my waste consumption with the help of your bag of tricks. That sounds like a wonderful spin on the original recipe! Way to go Cornelia! This looks so good! And I have a bunch of zucchini I need to use. Thanks for the recipe! My pleasure! I hope you enjoy it Robin! You can freeze chunks of zucchini and other simmer squash to use in smoothies. Mild and slightly sweet taste. Pretty pale green color when used with pineapple and yogurt. Try cold soups! Avocado Cilantro. Dilled Zucchini. Gazpacho. Google is your friend to find more ideas. We lived on Gazpacho one summer…I had forgotten about that! Thanks for sharing the great suggestions! A few years ago we had laundry baskets full of cabbage, tomatoes, eggplant, peppers, onions, okra, … The kitchen was overflowing at the end of summer. My husband was wringing his hands. But I had a plan. He is the great deer hunter and makes great sausage–and we had a lot in the freezer–so I asked him to just help me and we began to put tomatoes and onions and all the vegetables through the food processor and cook them in large kettles on the stove and I added the deer sausage cut into chunks and cajun seasoning. And when it was all combined we had a wonderful cajun stew. We froze it in bread loaf pans–and when frozen would knock it out and then into freezer bags. The loaves would stack wonderfully. When we wanted to eat it we might add some shrimp or not. The best thing about all of those ingredients is that they change to mexican, cajun, spanish, –anywhere around the world you want to take them–with just a little seasoning and a small adjustment in the ingredients. And a glut of eggplant or zucchini is a bonus as they take on the flavors of the other vegetables, yet add so much nutrition and bulk to the stew. And if you really have a glut, then think about freezing it. Soups aren’t great in the summer–but they are in the winter. We no longer have a garden, so no glut of vegetables. So my wonderful cajun stew is all gone. It was so good over rice or just big bowls on a winter evening. 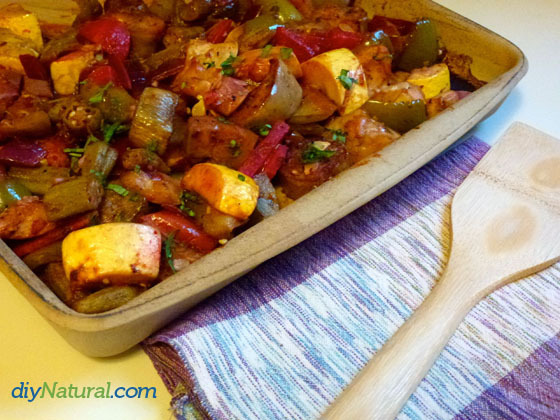 I got okra in my CSA box and found a super tagine recipe– okra, tomato and potato tagine. Not hard and super flavors. There are a lot of tagine recipes that use okra. Learned something new thanks to the box. Great suggestion! I have some more okra in the fridge I’m dying to use up this week! Betsy, Love all of the veggies and love ways of adding sides to meals where the work was done in advance. I recently found a recipe for DIY sauerkraut that is so simple and certainly would have helped with your 3 heads of cabbage. I haven’t tried it yet, so we can all experiment together. Pack a quart canning jar firmly with thin sliced cabbage. Add 1 Tablespoon of sea salt. Cover contents with boiling water. Insert a knife down into the jar to release bubbles. Put on a lid and a ring. Put in a dark cupboard for 3 weeks. After 3 weeks keep in the refrigerator. After it gets down to 1/3 of the jar, they make a new quart. Keep track by dating the lids so you know when it’s ready. Arrgh!! But I did make a soup that was enjoyed, even in summer. I find soups a great way to ‘hide’ good things, like spices, herbs, and other things. Yes, I don’t like waste, either. Broccoli!! Starting to yellow a bit, and all those really tough stalks!! black pepper, some organic salt combinations. Added to almost boiling water with chicken bouillon added. Cooked, then added ‘ready made potatoes’ ..those dried ones, stirred in. Ready in about 30 minutes. But then…added some grated mozza cheese into it. I could have put lots more in this also. But it was tasty, didn’t seem like ‘Ugh, soup again’. The ratatouille sounds great, what a great way to do this!! Much better to marinate them that way and let flavors blend. Broccoli was the bain of my existence a few summers ago, and I started making broccoli mashed potatoes! 🙂 Your recipe sounds tasty! Ratatouille sounds goods to me. A great way to use up all those veges. Go Tex-Mex. Cumino, chili powder & fresh cilantro are good on squash & zucchini. Spinach enchiladas are delicious.